Steady Flow Growler House has gathered a loyal following since they opened in August of 2105. The locally owned and operated business runs an impressive 4.9 star rating on Google business. And, now they're building upon their success and they have their sights set on Downtown Spokane. Steady Flow is currently working on opening a new location in the former River City Brewing Co. tap room space at 111 S. Cedar on the west side of Downtown. They plan to open there sometime later this Summer. They say this new location will be the " same people, same vibe " . They also plan to keep their Spokane Valley location open at 328 N Sullivan, in the plaza behind Shari's . The Downtown Steady Flow Growler House will have 26 taps of craft beer, cider, kombucha and more for growler fills. They also offer the same products by the pint as well. http://www.steadyflowgrowlerhouse.com or find them on social media. Washington Floral Service is a regional floral distributor based in Tacoma who is now coming our way and opening soon in Spokane. 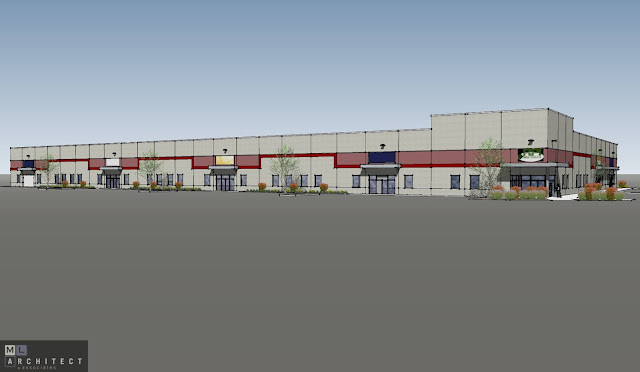 They will soon serve Eastern Washington , Idaho and Montana from a newly constructed 20,000 square foot facility on the West Plains that they are presently putting the finishing touches on. The new Spokane location will be at the corner of Thorpe and Grove Rd at 4310 S. Grove Rd. At this location they say there is plenty of parking for will call customers in a safe location, while still remaining accessible for local customers. The new facility will carry a full line of flowers, greens, plants, supplies and more. Volunteers of America is planning a new building at 1301 W. 3rd, just southwest of Downtown Spokane. They plan to relocate and expand their Hope House programs from a much smaller building at 111 W. 3rd to the new structure. The new Hope House will be a 4 story modern looking building with a ground floor homeless shelter, offering 120 beds designated for women. The upper 3 floors with will have 60 studio apartments for people who are trying in dire need of housing and may be on the street otherwise. They also plan on site support offices, class room space and a full kitchen. Construction will likely start in early 2019 and be completed later that year and will double the capacity of Hope House. Currently the site, which at the corner of 3rd and Adams is home to a long running Thai restaurant called Linnie's Thai. Volunteers of America does plan on demolishing the restaurant but despite a story from another business news source saying " Goodbye Linnie's Thai " it's simply not the end. Linnie's Thai will remain on W. 3rd through the end of July and move after that. Currently Linnie's Thai plans to re-open in Airway Heights sometime between August-October in or around the Crosspointe Shopping Center nearby Wal-Mart, we'll have more on that in the near future as it's still too early to confirm exact facts. I know I'll probably miss some but here is a quick review of some of the new restaurants coming to the Spokane area! Now open in the food court of Spokane Valley Mall is a cool new Asian food eatery called Soba Teppenyaki. Menu consists of reasonably priced noodle dishes, ramen and more. Also now open in Spokane Valley is Sams and Coffee. Albeit a bit hidden Sams occupies a 1600 square foot space at 12709 E. Mirabeau Pkwy for the workers of the surrounding Pinecroft Business Park and the entire community. Sams menu consists of a few sandwiches and salads in addition to beer and a full espresso line up. Not technically a restaurant it must be mentioned that The Grain Shed is now open in the South Perry district at 1026 E. Newark . 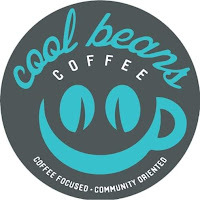 It's an awesome locally owned and operated place that is sort of 2 businesses in one. Culture Breads makes amazing fresh breads each day on the bakery portion and the on site brewery brews up fresh beers. It's a must to check out! Also on South Perry, Vessel Coffee Roasters is setting up a new neighborhood coffee shop in the formerly abandoned building at the corner of 11th Ave and Pittsburg. This is the same Vessel Coffee that is already operating a shop on N. Monroe. We've been hearing rave reviews already coming from Spokane's newest pizza shop, Dinardi's. Located in the same building as Bruchi's at 829 E. Boone , nearby Gonzaga this new restaurant serves up fresh pizzas, Stromboli, calzones, heros, wings, wraps and more. Not too much is known yet but we do know that the owner of Mizuna is working on opening a second restaurant in the Downtown area. This time it will be a new BBQ place called Austin Live Fire BBQ and is coming as early as next month to 421 W. Main. River City Pizza is already a cool local pizza joint serving Otis Orchards, but it looks like they are branching out and will soon open a new second location to serve Newman Lake. Work / licensing is in the works for this new River City Pizza at 12515 N. Newman Lake Rd. We mentioned this one on this blog sometime ago but wanted to re-mention as it is now officially open for business. Heritage Bar & Kitchen is in Downtown Spokane at 122 S. Monroe and is a full bar with food menu of burgers and some pub fare. Despite construction delays the new Noodle Express location in Airway Heights is now open! This is the 8th location for the Spokane based chain of fast casual Asian restaurants. The Airway Heights store is slightly over 2100 square feet and located in the Crosspoint Plaza at 10408 W US Hwy 2 suite 1. 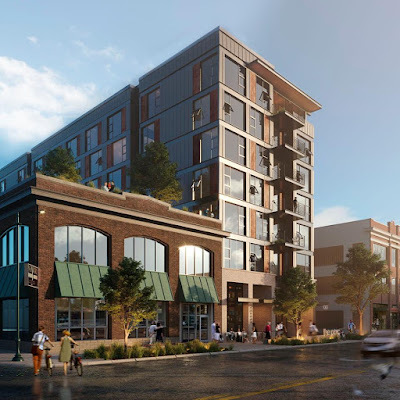 In case you missed it, a new 7 story mixed use building is in the works on the western edge of Downtown Spokane at 1309 W 1st. . 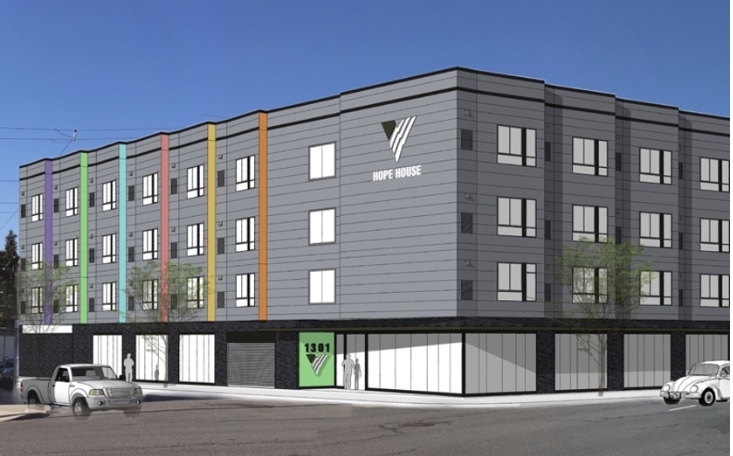 The new building will replace a much smaller single story building on the same site and will connect to the Password building directly next door at the corner of 1st & Adams. The same developers are also proposing a plan to renovate a former auto repair facility in the same block of W 1st into a new brewery and restaurant.